Beauty abounds with this easy to use page layout kit. 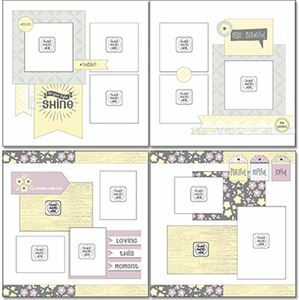 Follow the cutting instructions to maximize your supplies and create eight 2-page layouts you’ll love using to showcase your favorite memories. Image shows two of the eight layouts included in kit. Beauty abounds with this easy to use page layout kit. Follow the cutting instructions to maximize your supplies and create eight 2-page layouts you’ll love using to showcase your favorite memories. With 96 pieces, this kit is fun to create with, especially when there are sample layout images to create. Get your kit today and record your memories tomorrow!